Wash with care and remove any tough stalks. Young leaves are great raw in salad. 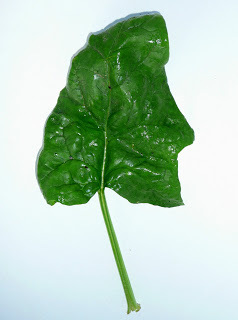 Larger leaves – may be stir fried for 2 minutes, microwaved for 2 minutes or steamed, as desired to wilt. Drain well. Serve with butter or a little cream and nutmeg. Prepare as above. Blanch for 2 minutes. Pack in bags and freeze. May be used for soups, pasta sauces, etc. Place tomatoes in deep oven-proof dish, add torn up basil leaves and season to taste. Layer wilted spinach leaves on top. Sprinkle over chicken and cover with cheese sauce. Finish with a sprinkling of breadcrumbs. Bake at 200C/Gas 6 for 40 minutes until bubbling and golden brown. Serves 2-3. Chicken may be replaced with any other cooked meat, sliced hard-boiled eggs, etc. Mix the pasta with the spinach and cheeses, and season to taste. Pour over sauce and toss ham strips over the top to garnish. Sprinkle with paprika if desired. Bake at 200C/ Gas 6 for 30 minutes until bubbling and golden brown. Serve with salad and crusty bread. Serves 2-3. Fry spinach gently in a little oil until wilted and remove from pan. Drain. Fry onion in remaining oil until translucent. Mix in flour and add wine gradually until smooth. Add spinach and single cream, season to taste, and then place in oven-proof dish. Sprinkle over breadcrumbs. Make two hollows with the back of a spoon. Break eggs into these hollows and sprinkle with cheese. Bake at 200C/Gas 6 for 20 minutes. Serves 2.